Below is a selection of previous woodboat materials questions. You are welcome to browse through the list, your problem may have already been answered or use the search box at the bottom on the page. to ask your woodboat materials questions. Thomas wants to know if Red Cedar could be used to plank a hull. What would be the best choice for rreplacing the teak decking on a 1989 trawler? What fabric would you recommend that Jim used to make his first sail? advice wanted on replacing the plywood bow deck with planked wood. Does anyone know about a product called "Tight and Seal" used when applying a canvas to a deck? What is the best alternative to the use of the traditional linseed oil putty with red lead powder? Dennis has some questions about the fiberglass for his Cedar strip canoe. Where is the best place to source such things as steering wheels and hydraulics? 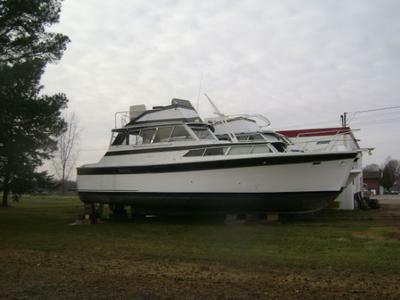 Is the hull on a 1968 30ft Owens Princess constructed of double "Planking" or is it planking "Over plywood"? Charles wants to know what kind of wood to use to replace the transom of a beautiful wooden boat he has been given. Can Claude replace the Oak frames of his 1966 Pacemaker 34 with another type of wood? Bill’s ex-lifeboat seems to have been originally painted with what looks like ‘bitumen’, is it necessary to clean it all off? Peter in Charlestown, NH, would like some advice on the type of wood to use for the framing on his 16' La Chatte Catamaran. How can Kevin protect his new varnish from the elements? Should Capt. Chuck continue to convert his "Splash of Lime" in Mississippi or would it be cheaper to take her to Haiti, Honduras or Costa Rica, where labour and material costs might be cheaper? What should Garth use to coat a 1:20 scale model, cedar planked, boat to protect it? What is the correct paint for my 26 foot wooden, clinker, ketch circa 1963 asked Richard from the UK? What kind of paint should Howard use on his canvas deck? Jim is looking for a boat building glue that doesn’t give off toxic vapors, any ideas? A Copper Bottom Paint question from Dawn in BC. Larry from Clearwater FL wants to know how to apply epoxy to a 16 ft cedar sailboat bottom. Dirk and Johanna in Galiano Island, Canada want to know if they should use marine quality paint on their 13' yellow cedar skiff or if a good quality exterior house paint would do. Does anyone know where one can buy a Dual Solar/12 volt Boat Ventilator? Peter in Sydney has an interesting question about the quality grading of timber. 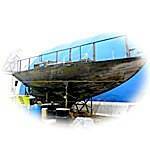 What is the best type of caulking epoxy or filler for the hull of a 55 ft 1960 wooden boat? Kelle is searching for a marine grade of MDF board? What is the correct type of wood filler & stain for Geoff to use to repair the mahogany plywood deck of his 1958 Peterborough Nomad? What was the name of that old Marine Wood Glue used by yards in the 1940-50's? Will wants to know what the best caulking material to use on wood carvel type planking is. Has anyone had experience of using “Resolcoat” water based epoxy system? Morgan, in Nova Scotia, has a question about replacing nail sick, rusted, galvanized clinch nails on his 30 ft. sailboat. Can cedar be used to replace some of the mahogany planks on a 1940 Rhodes 27? Can anyone help Phil with advice on using synthetic rope for the standing rigging on his gaffer? What is the best way to fasten teak the rails to the fore-deck asks John, from N.S.W Australia? Phil wants to know if he should varnish his mahogany, hull registration plate, before or after applying the vinyl numbers. What is best filler for Mark to use to fill the screw holes on his 1963, 15" Carver, mahogany plywood, lapstreak, runabout?